The two massive forces will collide each other at the main event of the UFC PPV (pay per view) event at Arena da Baixada in Curitiba, Brazil, on Saturday. The 38-year-old fighter Werdum defeated Cain Velasquez in the UFC 188 main event in Mexico last June to fetch the title. 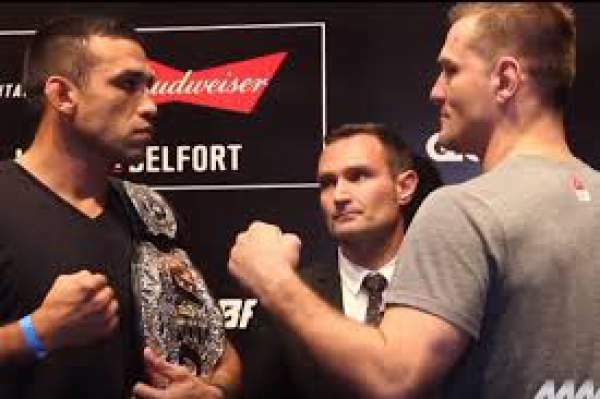 This will be Werdum’s first title defense match in the tournament. Weighing 240 pounds, he has shown a spectacular ground game. Miocic weighs a pound more. The 33-year-old player came here after a stunning KO/TKO defeating Andrei Arlovski at UFC 195 at January 2016. Miocic has won 11 matches out of a total 14 via knockout, and the speed of American fighter is still the talk of the town and center of attraction. The opponents for tonight fight were spotted together for the one final time ahead of the game. The same main event will feature one more classic fight in the middleweight division between Vitor Belfort and Ronaldo Souza. However, it was a heartbreaking news that Anderson Silva pulled out of the fight card just days before the main event citing an inflammation of the gallbladder. Brazil has produced several finest MMA superstars like Silva, Belfort, and Ronaldo and much more are coming soon. Today’s fight card also includes a fight of the debutante Cris Cyborg in the UFC. She is regarded as one of the finest female MMA fighters from the same nation. The 30-year-old fighter, Cyborg, is going to debut in the UFC after bagging the Invicta FC and the Strikeforce World Championship titles. She will fight against Leslie Smith of America in a catchweight bout. Dana White, the president of UFC, was quoted saying that this particular event can turn out to be the greatest of all UFC events ever held in Brazil. The Daily Mail stated that the president is expecting more than 45,000 live fans. It can become the biggest show in Brazilian combat sports history. UFC 198: Fabricio Werdum vs Stipe Miocic will start at ten p.m. EST / 7 p.m. PST (7:30 a.m. IST, 3 a.m. BST). India – Sony ESPN and Sony ESPN HD.